Introducing BrailleNote Touch, the note taker of the future. More than ever, students and professionals who are blind require an intelligent device that combines the simplicity and accessibility of a note taker with the power and efficiency of a modern smartphone or tablet. Our latest solution is the groundbreaking BrailleNote Touch, the first certified braille tablet providing Play Store access. KeySoft is the driving force behind the BrailleNote Touch, completely rewritten from the ground up to maximize the entire experience of modern users. Our TouchBraille algorithm brings the traditional braille control of a note taker to a modern and user-friendly platform. Teachers want an easy and interactive approach to help their students learn braille, while students need the most efficient tool to accomplish their everyday tasks, from writing documents and sending emails, to downloading and reading books. The BrailleNote Touch was designed to meet all of these needs and more, to completing class work easier and more efficient than ever. The BrailleNote Touch was designed to make everyday office tasks as simple and seamless as possible for blind users, from creating professional documents and emails to browsing the web. BrailleNote Touch keyboard is designed for those who don’t yet have the dexterity to type on the TouchBraille, or those who want to write long documents or papers. Completely removable, it fits directly over the touchscreen to provide a familiar user experience with no learning curve. Meets EMC standards of all targeted countries. EMC consists of the limitation of radiated electromagnetic emissions from the unit and immunity of the product against external electromagnetic field and electrostatic discharge. At this time in North America HumanWare offers a unique program which ensures that Touch users are rarely without their units. It is called the BrailleNote Care Program. Because the BrailleNote Touch offers a revolutionary removable internal storage mechanism, which allows users to use any Touch device as if it was their own, HumanWare has created the BrailleNote Care Program to ensure you are never without your productivity tool. The BrailleNote Care Program, Always there when you need it. An extra year beyond the manufacturer’s warranty. Anytime you need a repair, HumanWare will provide you a loaner unit which you can insert your internal storage into, if the card is not damaged of course, and use as if it was your own device. HumanWare will repair your unit and then ship it back, with the expectation that you will ship back the loaner unit immediately. The BrailleNote Care program enables you to receive second day air shipping to ensure you can stay productive with a Touch unit. 1 included braille display cleaning per year of the term of the Care Program. Loners are not available during a display cleaning. Note that Accessories and battery are not included as covered items in the BrailleNote Care Program. A: KeySoft is in general the way you experience the BrailleNote Touch. It is both the environment you see when you start your Touch, such as the main menu, various KeySoft apps like KeyWord, etc. But it is also the primary accessibility service which makes apps and your experience with the Touch an accessible one. For example KeySoft handles all the speech and Braille output you receive. It also controls TouchBraille or keyboard entry when you edit in various apps. In short KeySoft is the interface you experience when using your Touch, ensuring everything is both accessible and efficient when using the device. Q: On my previous BrailleNotes I was able to use contextual help to quickly understand keystrokes and how to navigate my BrailleNote. Does the Touch have something like this? A: In past versions of KeySoft contextual help provided both navigation commands along with every keyboard shortcut for almost every situation you entered with the BrailleNote. Many users mentioned that this amount of information was often overwhelming. KeySoft on the BrailleNote Touch uses contextual help to instruct you for your current location and how to navigate it, but uses a new function called the context menu to inform you of all the keyboard shortcuts for a current app or situation. To activate the context menu, press space with M, or press the menu button on the front of your Touch. The menu button is the square shaped button next to your home button. Similar to right clicking on a windows computer, the context menu provides the most common functions and keyboard shortcuts for your current situation in a KeySoft app. For example, let’s imagine you have forgotten the keyboard shortcut to send an email. Simply activate the context menu from your email message and navigate through its items. You will find one which says “Send Email, backspace with S". You can now press enter here to actually send the email, and also will remember that backspace with S is the shortcut to send emails quickly, the next time you need to send an email. A: TouchBraille is the innovative method that you can use to enter Braille on the touch screen of the BrailleNote. While using TouchBraille the virtual keys will find your fingers. To type using TouchBraille simply lay all 10 fingers on the Touch's touch screen to have the Touch recognize your fingers. To confirm your fingers have been recognized, you will receive a short vibration. After feeling the vibration you can begin typing on the touch screen as if you were typing on a physical BrailleNote keyboard. Using your right little finger for enter (Dot 8) and your left little finger for backspace (Dot 7). You can use either of your thumbs for the spacebar. Note, when having your fingers recognized, you do not need to lay all ten fingers down together. For example you can lay 5 fingers down on the screen and then keep them there, while adding your other 5 fingers in addition to them at a later moment. This allows you to easily spot read the Braille display with one hand while the other hand rests on the screen. A: Yes. Because TouchBraille is used to type on a touch screen, you do not need to use virtually any force when typing. The recommended position of your hands when typing using TouchBraille is to place your wrists on or in front of the Braille display and place all 10 fingers on the screen to receive the short recognition vibration. Upon feeling this vibration, lift all 10 fingers only slightly off the screen while leaving your wrists resting on or in front of the Braille display. Type normally while flexing only your fingers up and down. This insures that you are allowing the keys to follow your fingers in a general predictable pattern. TouchBraille provides a method for typing which allows a brailleist to type using less motion. Thus producing less strain on the hands. A: Because KeySoft allows for you to use first letter navigation to find items on the screen more efficiently, you must identify when you want to be inserting text, or editing, vs using first letter navigation to quickly jump to items. This mode is called edit mode. When you want to type characters into edit boxes or text fields, you first need to activate those edit boxes to tell KeySoft you are ready to enter text. When you press enter or a router key on an edit box, you will activate edit mode. You will know you are in edit mode because you will hear a rising tone if you have sounds turned on, and will see your cursor appear between the edit box brackets. Now anything you type will be entered into that edit field. to leave edit mode, you can simply press the next or previous thumb key and your focus will leave the edit box and go to the next item on the screen and you will be no longer editing. Alternatively you can simply press exit (Space with E) or the back button, and your focus will remain on the edit box, but you will be out of edit mode. You will hear a lowering tone and see your cursor disappear from the edit box on the display. Now you can go back to using first letter navigation to jump to different items on the screen. Note that in some KeySoft or 3rd party apps, doing a function may automatically put you in edit mode. For example, in KeyMail, choosing the “New Message” option will automatically open the new message composition screen with your focus in the “send to” edit field and edit mode active. In certain situations this is done to simplify the flow of doing a task. Also pressing enter while editing can do a number of things depending on what the app developer has set that function to do. For example, if writing an email, after typing your recipient’s email address, pressing enter activates a next function and moves your focus to the subject field in edit mode so you can immediately type the subject of your email message. You can check the functionality of the enter key in the contextual help menu. Q: When I am typing in computer Braille I cannot perform shortcuts that use enter or backspace. Why? A: Because the BrailleNote Touch will be able to be localized in many languages, some using 8 dot Braille and others using 6 dot Braille, users have asked that computer Braille be more standardized to ensure symbols are easy to type. This is why computer Braille is always using 8 dot computer Braille. Now if you are using English, for example, which does not have any specific characters represented by just dot 7 or just dot 8, dot 7 or dot 8 function as backspace or enter, as you are used to. However if you are typing in a language for computer Braille which has characters which are represented by just dot 7 or just dot 8, then you will need to press space with dot 7 to do a backspace or space with dot 8 to do an enter. The general rule to remember is that when in computer Braille, all commands must use the space bar. So if you are using English computer Braille, and want to check the time which is normally enter with T, you need to press enter with space with T. If you want to change your language profile, which is done usually with enter with L, you need to press enter with space with L in computer Braille. A: To type the @ symbol press dot 7 and dot 4. To type an _ press dots 4-5-6. A: The BrailleNote Touch comes with a specific AC adaptor that ships with your BrailleNote Touch. You will be able to charge your Touch fully in around 4-5 hours of having it plugged in to AC power. Because the Touch uses a micro USB cable to charge and connect to computers for data transfer, you can potentially charge the device with other AC adaptors for other devices which use a micro USB connector, however note that when not using the specific adaptor, or connected straight to a PC, charging time is greatly diminished. If you want to fully charge your Touch it is highly recommended to use the adaptor that shipped with your Touch. You can verify that it is charging optimally by doing the power command of enter with P. After the percentage you will see either “AC charging”, or “USB charging”. AC charging means it is charging as fast as possible. A: At the time of launch there is limited support for QWERTY keyboards. Currently you can connect a USB or pair a Bluetooth keyboard to your Touch and use it when editing. Eventually all KeySoft non-editing commands will be supported by the QWERTY keyboard. This will be included in an upcoming version. On screen TouchBraille will always be available and the default mode when using the touch screen as this is the most efficient method of using the Touch. Q: Can I install 3rd party apps from the GooglePlay Store? A: Absolutely, this is one of the most significant advantages of the BrailleNote Touch. The BrailleNote Touch is the first accessibility device designed for those who are visually impaired, to be certified by Google. It brings the efficiency of using a traditional note taker, to a mainstream tablet designed for a user who is visually impaired. Keep in mind that KeySoft abides by the accessibility rules provided to android developers, meaning the developer of the app you would like to download has to have developed the app with accessibility in mind. Many apps on the PlayStore are accessible, however many are not. Remember that the accessibility of a 3rd party app completely depends on the developer of that app, and HumanWare in no way guarantees the quality of accessibility when using 3rd party apps. If you do come across an app which does not work with KeySoft, your best course of action is to contact the developer of that app, to explain the inaccessibility of their app related to Google’s accessibility guidelines. Q: How do I select text using the BrailleNote Touch? While editing, to select text you need to start and stop a selection. To start the selection, place your cursor on or in front of the character where you want the selection to begin, and press enter with the letter S together. You will see and hear “Selection Start”. If you check your cursor, you will also notice that your cursor is flashing, to indicate that you are currently in the process of choosing your selection ending point. Now position your cursor after the character where you want your selection to end. Press enter with the letter S together and you will see and hear, “Selection End”. You will also notice that your selected text is now underlined by dots 7 and 8 to indicate what has been selected. From here you can Cut, copy or paste the selection. Q: How do I create a print hard copy for a sighted teacher or colleague? A: Because the BrailleNote Touch is technically a Braille tablet, the reality is that printer manufacturers do not create direct USB drivers to connect to tablets and smart phones. Having said this, there are several simple, and often more convenient ways to print from your BrailleNote Touch. Hp ePrint – Free, (Allowing you to print to any HP printer on the network. After the preview has been generated the iPrint&Scan app opens and at the bottom of the screen is a print button. If the printer and the BrailleNote Touch are both connected to the same wireless network there is no network setup required. The BrailleNote Touch will allow you to print a document using 2 different methods. The first method of printing will utilize an Application developed by various printer manufacturers. Apps for direct printing to WI-FI enabled printers exist for manufacturers such as: HP, Brother, Epson, Canon, Samsung and many more. The second method of printing from the BrailleNote touch will use Google’s Cloud Print service. This option allows for you to print from virtually any printer that is connected to a computer with an internet connection. The following steps will demonstrate how you are able to add a printer connected to a computer. One must use the Google Chrome browser to add the printer to a Cloud Print account. You will also need to be signed in to the Google account associated with the BrailleNote Touch in the Chrome browser. This tutorial assumes you are using a screen reader. On a PC, launch the Chrome browser. Enter the menu bar by pressing alt + f, and select settings. In the search settings box, type in the words “cloud print,” and press enter. Once you activate this button, you will see a list of classic printers that are currently installed on your computer. Now your printer will be added to your Cloud Print account and will be able to receive documents from the touch as long as the printer remains connected to the computer with an internet connection. Q: Can I emboss from my BrailleNote Touch? A: At launch we are working with embosser manufacturers which provide on-board braille translation. This is because the Touch only offers documents in mainstream formats, and is no longer always working in a braille ready format, (BRF, or KWB). So the Touch needs the embosser to perform the braille translation internally to provide a braille hard copy. We are working with multiple embosser manufacturers and hope to have a solution in place at the time of shipment of the BrailleNote Touch units. Email your desired document either in .docx or .doc format, or otherwise you are able to send to a recipient as a PDF file as well. They can emboss the document from their computer using a braille translation program such as Duxbury. Copy the file you want to emboss to a thumb drive in .doc format. Some of the embossers, such as those from Enabling Technologies or Index possess a USB port on the embosser which allows you to simply plug in the drive and emboss directly from it. A: The BrailleNote Touch uses Android as its operating system, but the experience you have on a daily basis is KeySoft. The daily productivity apps are based on KeySoft and even when you use 3rd party Android apps, you are experiencing KeySoft structure when navigating around and interacting with those apps. Q: What version of Android is the BrailleNote Touch using as its operating system? A: The Touch uses android 4.4 Kitkat as its operating system in the background. We needed a stable foundation to build KeySoft upon and Kitkat provided the best experience for our users with the accessibility benefits provided to our developers by Google. Today almost 50% of all android devices are running an operating system less than android Kitkat worldwide, so we are confident that Google will continue to support Kitkat for several years to come. 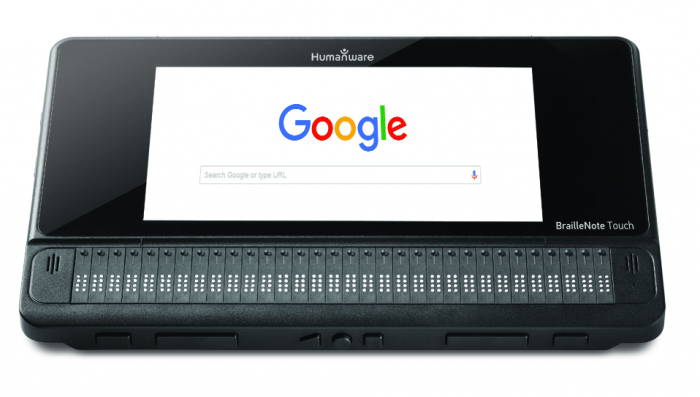 And as HumanWare has developed KeySoft, the accessibility service that runs on the Touch, it is not dependent on google accessibility modifications and will be modified as needed to accommodate for any app or system changes. Q: Will The Touch receive security updates if Google makes them available? A: Yes, Google supports Android Kitkat and provides HumanWare any security patches which are made available for them to be provided in a wireless update of the BrailleNote Touch’s software. As security, stability and efficiency are our top priorities with this product such security updates will be made available immediately. Q: When HumanWare releases an update for my Touch, how do I update the device? A: An update will come in two forms. Either you will be notified via a notification and you need to only click a router key on the notification, or if you see a notice from a HumanWare eBlast or hear from someone that the Touch has an update, simply select KeyUpdater from the all apps menu and your Touch will tell you there is a new update available. Simply press enter or a router key on it and it will download and install. Updates can take between a half hour to an hour to download and install depending on your internet speed. But you can download the update in the background while doing other things. Alternatively you can download the update file from the HumanWare web site and put the downloaded zip file on a Thumb drive or SD card. Simply press a router key on the notification when it appears telling you that a system update is available, and the update will install. Note that the Touch needs at least 50% battery power when not connected to a power outlet, and using AC power, it needs a charge of at minimum 20%. Q: Do you offer any extended warranty program? A: At this time in North America HumanWare offers a unique program which ensures that Touch users are rarely without their units. It is called the HumanWare Care Program. Because the BrailleNote Touch offers a revolutionary removable internal storage mechanism, which allows users to use any Touch device as if it was their own, HumanWare has created the HumanWare Care Program. Within 30 days of purchasing your BrailleNote Touch, ask to become a member of the HumanWare Care Program at a lower price. If you purchase after the first 30 days but within the first year, the program can still be purchased but at a slightly higher price. Anytime you need a repair, HumanWare will provide you a loaner unit which you can insert your internal storage into, if the card is not damaged of course, and use as if it was your own device. HumanWare will repair your unit and then ship it back, with the expectation that you will ship back the loaner unit immediately. If units are not shipped within 5 business days, a credit card on file will be charged. The HumanWare Care program enables you to receive second day air shipping to ensure you can stay productive with a Touch unit. 1 included braille display cleaning during the term of the Care Program. Q: I have downloaded an app and it consistently says “WebView”. I can still navigate with my thumb keys but I don’t receive any braille. A: There are currently limitations in version 1 of the Touch with certain apps using the Android webview control. This control is not designed for braille access and HumanWare is working with Google to significantly improve this for Touch users. Q: Can the Braille Note Touch open files created as a KWB file on past Braille Note devices? A: Because the BrailleNote Touch always is working in mainstream document formats with perfect braille translation, it is unable to open KWB files. Please follow the steps below to export files from KWB format to Microsoft word format using the Braille Note Apex. Press dots (1-2-3-4-5-6 with space) to reach the main menu. Type the letter f to go into the file manager menu. Type the letter t to go into the translation menu. Type the letter e to choose the export option. Press (space with d) to reach drive list. Type the letter f to choose the flash disk. The Braille Note Apex will prompt export files from which folder? Press space to reach the folder list. Type the first letter of the folder where the files you wish to export are located. Continue typing the first letter of the item you are looking for, or space until the desired folder is reached. Press enter. The Braille Note Apex will prompt document name? Press the space bar until the first file in the list is reached. To mark all the files in this folder, press (enter with dots 2-3-5-6). To select files individually, press space until you reach the first file you wish to mark and press (space with M) to mark the file. Repeat this step until all of the files you wish to export have been marked. Alternatively you can press enter with 2-3-5-6 to mark all files in a folder to quickly get everything exported from one folder. press (space with dots 3-4) until Microsoft word is selected. press enter. The Braille Note will prompt destination drive? Insert a thumb drive or s d card into the Braille Note Apex. Type the Letter s for s d cards, or h for hard disk which is the thumb drive. The Braille Note will prompt folder name? Type the name of the folder where you wish to place the exported files. If the folder exists on the drive, the files will be exported. If the folder does not exist on the drive, the Braille Note will prompt folder does not exist, create a new folder? Press the letter y, the folder will be created, and the files will be exported. Q: Can I bring my files from my past BrailleNote’s address list, calendar, or databases to my new Touch? A: Because the Touch is using truly modern synchronization technology that was not available in past models of the BrailleNote, there is no direct method to transfer these types of files to the Touch. If you have access to a PC running Windows 7 or earlier, you can use KeySync to sync your calendar and contacts with Microsoft Outlook. Note that due to many variables related to Microsoft outlook, virus protection programs etc, HumanWare cannot guarantee this valid synchronization. Alternatively in KeyList, KeyPlan or KeyBase on past BrailleNotes, you can print your calendar, contacts list, or databases to either a file or directly emboss to a hard copy. At that point you could enter them into either the PC using your Google or Exchange contacts and calendars and have them sync directly to the Touch. Or you can enter them directly into the Touch itself. Q: Does the BraileNote Touch provide a specific configuration for those with use of only one hand? A: One handed mode is not available at this time. Q: What are the dimensions and weight of the Braillenote Touch both by itself and, when it is in its carrying case with the braille keyboard? Q: Can the Touch be used as a braille display for other devices? A: At launch the Touch cannot be used as a braille display with other devices. This is high on our priority list and will be addressed in a future update. Q: can users use bookshare to read books on the unit? A: Absolutely, the Touch comes with the popular Victor Reader book reading function on it, optimized for braille. You can download books from the web and read them using the Victor app, or even download the “GoRead” app from the GooglePlay Store. Q: Does the touch have a gps equivalent to the braille note apex? A: The Touch has a built in GPS chip but does not come with any specific GPS apps. There are many accessible GPS apps on the PlayStore which can be downloaded and used. HereMaps is an offline GPS app which can be downloaded freely, along with “NearBy Explorer”. At the time of launch a list of recommended accessible apps will be available on HumanWare’s web site. Q: How do you write documents on the Touch? A: The Touch comes with KeyWord, the popular KeySoft word processor, but optimized for today’s modern user. In addition to always working in a modern file format of .docx or .doc, as soon as you choose to create a document, you are immediately ready to start typing in whatever form of braille you choose. You can also see all formatting changes on the braille display, and apply changes in formatting from directly within KeyWord. Q: Can the BrailleNote Touch record like past BrailleNote models? If so, does it have a record button on it? A: The BrailleNote Touch can use many accessible recording apps as it does contain an internal and external mic jack. The Touch does not have a designated record button. Q: Will the BrailleNote Touch be able to write Nemeth code and be able to open and read presentations? A: Currently one can type UEB math as UEB is a general language covering many types of braille. However the print results will appear as abbreviations. Regarding Nemeth, there is currently not support for direct Nemeth input with print output, however this is extremely high on our priority list and will be addressed in a future update. It is possible to type many equations using computer braille and Unicode symbols for correct print representation. Regarding presentations, the Touch does not have presentation apps installed by default, however several 3rd party accessible apps allow you to open powerpoint presentations. Q: Does the BrailleNote Touch have a reset button on it? If so, what kind of resets will users be able to perform. A: The Touch does not have a reset button. Holding the power button for 15 seconds will force shut down the unit and then pressing it again will restart it. But keep in mind that because Android is the backbone of KeySoft now, resetting your entire unit will rarely need to be done going forward. Because KeySoft has been rewritten from the ground up, now if a problem occurs, that problem will be local to that specific app. You will be able to close the app completely and reopen it without ever needing to restart your Touch, ensuring you stay efficient at all times. Q: Does the Braille on the touch feel more like the current Apex or like the Brailliant? Q: What types of WIFI does the Touch support? A: The Touch supports WIFI bands of B, G or N.
Q: What version of Bluetooth does it use? A: .txt, daisy text, daisy audio, mp3, unprotected WMA. Q: What ports does the Braille Note Touch provide? A: micro USB for charging and data transfer, USB 2.0 host port, SDHC slot and HDMI. Q: What is the speech like on the Braille Note touch? A: The default speech engine is Acapella, but one can download any 3rd party TTS engine they prefer. Q: Can the speech be turned off and on like on other Braille Notes? A: Yes, with the same toggle of space with previous thumb key (Far left). Q: Is there a spell check option on the Braille Note Touch? A: Yes KeyWord provides a spell checker.